...it's time to evaluate where the Reds stand. When all is said and done, the Reds chose not to shake things up. The Reds chose not to restructure the lineup. The Reds chose not to hold a fire-sale. When it was all said and done, the Reds chose not to do much at all. They decided to stay the course, which is slightly disappointing and yet, slightly encouraging. Personally, I find it slightly encouraging because I don't believe the Reds need to hold a fire-sale. I think this team drastically underperformed in the first half and are closer to being a playoff contender than many realize. This team should be around .500, which puts the playoffs in reach with a couple of tweaks to the roster and makes the idea of a fire-sale ill-advised. The Reds have a very strong core of young talent. A core that includes Brandon Phillips, Homer Bailey, Josh Hamilton, Joey Votto, and Jay Bruce stacks up rather well with just about any team's core of young talent. Shifting the focus of the team away from Adam Dunn and Ken Griffey Jr. towards this young collection of talent should have been the goal. We have passed the point where we are building around Dunn/Griffey, so reorganizing the roster with this goal in mind would have been wise. With that in mind, it would have been a nice idea if they could have dealt some of their older talent to bring in one or two more players to add to this core of young talent. The list of players who were rumored to be dealt included Adam Dunn, Ken Griffey Jr., Scott Hatteberg, Jeff Conine, David Weathers, and Mike Stanton. Out of this group, Krivsky only dealt away Kyle Lohse, which, as mentioned previously, is a deal I like. The rest are still with the Reds, so let's take a quick look at their situations. Adam Dunn: This is the big chip that could have reconfigured the entire roster, which heading into 2008 wouldn't have been such a bad thing. Dunn was the only player whose trade value got substantial worse after not being dealt. Dunn is the only player for whom there was a pressing need to make a deal. At this point, Dunn is very likely to be a Cincinnati Red until after the 2008 season. The Reds have a $13M team option on Dunn for 2008, but Dunn gave the Reds that option during the last contract negotiation in exchange for trade protection. 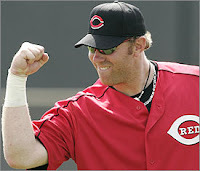 If the Reds exercise the option, then Dunn gets full no-trade protection from that point until June of 2008. In June of 2008, Dunn will provide a list of teams to which he can be traded. So, in essence, the Reds will be facing the same problem they had with Dunn at this trade deadline, only far worse. Teams no longer want to give up 6 cost effective years of prospect production for a half season rental of an expensive player. That was the problem this year and will be continue to be a problem next year. However, next year Dunn's no trade list will pare down the number of suitors, which will diminish the demand for his services to a level even lower than this year's demand. Less competition and demand, very likely makes for a reduced return in trade. At this point, Dunn isn't going anywhere until he leaves for compensatory draft picks after the 2008 season, which I think is a wasted opportunity for the Reds to reshape this team. Ken Griffey Jr.: Realistically speaking, Jr. isn't going anywhere until Jr. pushes to get out. Just like his Seattle departure, Jr. will control when he wants to leave. When Jr. wants to go, then he'll go. Not until then. Scott Hatteberg: Just a tremendous hitter with an awesome approach and seems to be a Krivsky favorite. Personally, I wouldn't be surprised to see Krivsky work the 2008 roster to save Hatteberg's starting job. At the very least, he could be a very valuable bat off the bench in 2008, so I'm not sorry to see him stay. Mike Stanton: Frankly, he just may not have had any trade value at all. Veteran savvy only goes so far, at some point you have to produce. Stanton has failed to do so and no one is likely interested in picking up his salary for next season, which is the big stumbling block. Still, Stanton is one possibility to pass through waivers in August and be dealt to a contender. Unfortunately, even that is a long shot. Jeff Conine: He's 41 years old and might make a nice veteran, bat-off-the-bench for a playoff contender, but no one is likely to give up much to get him. David Weathers: As for Weathers, I can see the argument for keeping him. I don't agree with it, but the idea of keeping Weathers because he signed to a cost effective contract for 2008 and would preclude the Reds having to bring in both a closer and a setup man is certainly a logical one. That said, I think Weathers would have brought in a nice return and due to his age is no sure bet to even be effective in 2008. If the Reds head into 2008 with Weathers as the primary setup man, then I think they are once again headed for trouble. Regardless of whether Weathers in the mix in 2008, the Reds need to bring in a shutdown setup man and an effective closer for 2008. I don't think you can count on a 38 year old reliever who relies on grit more than pure stuff to maintain his effectiveness. There is just far too much risk to rely heavily on Weathers for next season. Given that he shouldn't be the primary 8th or 9th inning reliever, Weathers really isn't needed at all. Relying on Weathers for the 7th is overkill, as we have countless young arms who can work the 7th. To me, Weathers trade value is at an all-time high. In fact, his trade value substantial outpaces his actual value to the Reds at this point. Dealing Weathers looks like the better play, but I can certainly see the logic to keeping him. Only time will tell which strategy is correct. All in all, I'm really only disappointed that we didn't move Dunn for younger talent. I like the two moves that were made and can understand the rationale for keeping everyone else. That said, I think moving Dunn for young talent would have had a large trickle down effect on this organization. The talent we could have received in trade would have been of value, but moving Dunn may have had substantial ancillary benefits as well. These benefits likely would have included a new style of play for the team, improved outfield defense, a new attitude in the clubhouse, the opportunity to move Griffey to leftfield, and freeing up cash to pursue free agents to fill other holes in the roster. There are just far too many advantages to have been gained by trading Dunn to jusitify keeping him for 2008. Some people want to remove Krivsky due to the lack of activity at the deadline. Personally, I think that's a mistake. It seems fans in Cincy are always of the mind that the grass is always greener on the other side. The Reds have had far too much turmoil over the past decade and you cannot have a successful organization without stability. It's time to give Krivsky some time to build this organization. "The Trade" was truly terrible, but outside of that he hasn't done anything that truly makes him deserving of being fired. He's made some tremendous acquisitions of undervalued talent and may have done so again with Cantu. Not to mention, for the first time in quite a while, the Reds farm system is starting to bear fruit. Despite the knee-jerk public outcry to the contrary, there's actually much more positive than negative going on in Cincy these days. Well, the Reds traded Kyle Lohse to the Phillies for LHP Matt Maloney. To me, that doesn't seem like a good deal at first blush, but if we dig deeper it may actually be the best deal we could have cut. While originally I had hoped to see Lohse net compensatory draft picks for the Reds after leaving via free agency, but I'm no longer sure that would have been possible. Maloney was worn out from pitching Mississippi to the NCAA super regionals when he turned pro in 2005, so the Phillies didn't see him at his best until 2006. 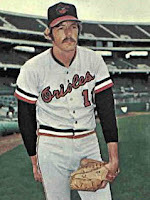 His best was very good, as he was named South Atlantic League pitcher of the year after leading the circuit in wins, innings, and strikeouts while finishing second in ERA. Maloney attacks hitters by throwing four pitchs for strikes. His stuff is average across the board, but his advanced feel makes it play up, and he creates good deception with his easily repeatable delivery. His 86-88 mph sinker is his best pitch because of its late movement. His changeup isn't far behind and he'll throw it in any count. He also has an 11-to-5 curveball and a slider. Maloney's lack of velocity leaves him with little margin for error, and his secondary pitches need work to translate at the upper levels. his curveball has good downward spiral but can flatten out at times, and his slider needs to be tighter and harder if it's going to remain in his arsenal. On the high end, Maloney could be a No.4 starter. Without better breaking stuff, he could be a middle reliever. Considering his savvy and that he'll be 23 in 2007, he could skip a level and head straight to Double-A. At the very least, he's a southpaw whose best pitch is his sinker and also features a nice change-up. He's not great, but not a bad return on Lohse. Unfortunately, given that Lohse did not even qualify as a type C pitcher in 2006, it hardly seems likely that he'll be qualified as a type A or B free agent after this year. So, compensatory picks may not have been a realistic option after all. Given the choice between letting Lohse walk for nothing and adding Maloney, it seems like a rather nice trade for the Reds. Every offseason, the Elias Sports Bureau compiles rankings of all major league players, based on the previous two years' stats. The players are ranked by position groups: catchers; designated hitters, first basemen and outfielders; second basemen, third basemen and shortstops; starting pitchers; and relief pitchers. The players are then broken down into Type A, Type B and unranked free agents. Type A players are players rated in the top 20 percent of all players at their position. Type B players are players rated in the 21-40 percent bracket at their position. Because players are only compared to others at similar positions, some players might be a Type A but seem to be not as good as some Type B players, etc., but that's how the system works. Type A: Team losing player gets signing team's first-round pick as well as a supplemental first-round pick. If the signing team is picking in the first half of the first round, it loses its second-rounder instead of their first-rounder. Type B: Team losing player gets a supplemental first-round pick. If a team doesn't offer arbitration to its free agent, it gets nothing when he signs with another team. This brings up the next question of why don't the teams always offer arbitration? The answer is, they might simply be afraid he'll accept it. It's a gamble some teams aren't willing to take, even if it seems likely the player is heading out of town. In 2006, Kyle Lohse was ranked by Elias as the #67 starting pitcher in the NL. 305.2 IP, 361 Hits, 37 HRs, 88 BBs, 183 Ks, W/L 14-23, an ERA of 4.87, and a 1.47 WHIP. 306.2 IP, 346 Hits, 37 HRs, 89 BBs, 206 Ks, W/L 14-24, an ERA of 5.10, and a 1.42 WHIP. Those stats are eerily similar to his 2005 & 2006 stats and a case could be made that they are a bit worse. In order for the Reds to have received compensatory picks for Lohse, he would have to climb up around 15 places in the 2007 rankings, which would have made him a type B pitcher. However, his combined 2007 & 2006 stats do not represent a substantial improvement over his combined 2006 & 2005 stats, so he may not move up high enough to warrant compensatory picks. Anything less than an improvement of ~15 spots in the rankings would result in him being classified as a type C player or not even ranked at all, and, of course, neither of those two designations would have garnered the Reds compensatory picks. Basically, the Reds made a calculated gamble that Lohse wouldn't have brought in any draft picks after the season, so they made the only logical decision. They brought in value rather than end up with nothing after the season. Given that Lohse's agent is Scott Boras, there is very little chance the Reds would be able to re-sign him, even if they wanted to do so. So, all in all, it seems like another solid move by the Reds, as "something" is still more valuable than "nothing". Well, the Reds made their long anticipated splash before the trade deadline, but it came in the form that few could have expected. The Reds acquired Jorge Cantu, Shaun Cumberland, and cash for Brian Shackelford, Calvin Medlock, and future considerations. Oddly enough, I like the deal itself more than I like Jorge Cantu. The Reds acquired a hitter with some upside, but gave up little of note to do so. Shackelford spent some time in the majors, but had some legal trouble last year and never seemed to regain his composure. Medlock had a very nice year at AA, but doesn't have the kind of upside that may make the Reds regret giving him up. This type of deal is where Reds GM Wayne Krivsky seems to thrive. These low risk/high reward deals have been very good to Wayne Krivsky. He has acquired several undervalued players who have paid huge dividends. Krivsky acquired Brandon Phillips, Josh Hamilton, and David Ross at a very low cost. These deals cost little to make, but have the potential for a substantial payoff. The acquisition of Jorge Cantu is just such a deal. While I like the nature and type of deal, I'm not wild about Jorge Cantu. Cantu has more potential than the players the Reds gave up, but he's far from certain to be a viable MLB player. He's the type of player that the Reds really don't need. He is an undisciplined hitter who lacks speed and is a liability with the glove. Cantu's glove prevents him from being a viable option in the middle of the infield, while his bat prevents him from being a viable option at a corner infield spot. As such, he's really nothing more than a bench player and a spot starter, especially when you consider that the Reds have top prospect Joey Votto as the future at first and Brandon Phillips entrenched at 2b. Accommodating Cantu as a starter would require some heavy duty roster reworking and potentially playing players out of position. If the Reds envision Cantu as being a utlity player and bat off the bench, then this is a solid acquisition. 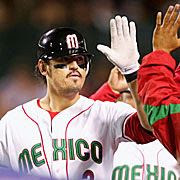 Much is made of Cantu's performance in 2005, as he hit 28 homeruns and had 117 RBI. That said, he also posted a less than inspiring line of .286/.311/.497/.808. His counting stats were good that season, but his ratios weren't great. Not to mention, he had a strikeout to walk ratio of 83/19. That kind of free swinging approach can be exploited by pitchers as they become more familiar with a hitter and word of his weaknesses spreads around the league. Earlier this year, Cantu lost his roster spot on the Devil Rays. In the process, he didn't comport himself very well. He openly campaigned for a trade and displayed a generally poor attitude. Rather than work hard to improve his game and reclaim his spot at the Major League level, Cantu instead seemed to sulk and pout. At AAA Durham this year, Cantu hit a paltry .244/.303/.356/.659, indicative of a poor skillset, a poor attitude, or both. Maybe the change of scenery will be just what he needs, but at this point his performance and attitude are cause for concern. Krivsky seems to be much more adept at trades that bringing in undervalued talent than he is at executing winning trades that involve giving up value. Krivsky's stated asking price for Adam Dunn, a proven pitcher, an infielder, and a top prospect, did little more than scare off potential trading partners. Krivsky seems to be better at spotting undervalued talent than he is at understanding the market valuation for established players. However, time will tell if the acquisition of the undervalued Jorge Cantu will be yet another winner for Krivsky. At the very least, Cantu should be a nice bat off the bench, but he'll need to prove that he is deserving before being given a more substantial role. Unfortunately, scandals are rocking most of the major sports over the past few weeks. In Major League Baseball, you have Barry Bonds inching ever closer to the most hallowed record in all of sports, an NBA official accused of gambling on games he officiated, allegations of dogfighting and general misbehavior in the NFL, and yet more failed drug tests in the Tour de France. However, the NFL scandal is the most interesting one to me at the moment. Lately, it seems it has become fashionable to bash Major League Baseball and its Collective Bargaining Agreement, while heaping praise on the NFL. In point of fact, if you take a more comprehensive look, then it's hard to overlook the fact that there is substantial inequity between the power of the NFL Players Union and the NFL. And, many of the gains in popularity achieved by the NFL have come largely at the expense of the players' well-being. The recent cases of Mike Vick and Pacman Jones provide for an interesting dichotomy between the labor practices of the NFL and MLB. When Marvin Miller was fighting to establish the Major League Baseball Players Association as the primary representative body of the players, one of the landmark achievements was the concession that was negotiated to establish an independent process for dispute/grievance resolution. The ability of players to have their grievances heard by an independent third party paved the way for many of the gains the players were able to make over the years. The commissioner (who is in the direct employ of the owners, not an impartial advocate for both the players and the owners as commonly believed) no longer had absolute power to run roughshod over the players. Unfortunately, the NFL Players' Union has never been strong enough to gain that right through the collective bargaining process. That basic, fundamental right determines in large part how much power the commissioner has over his respective players. In MLB, the commissioner does not have absolute power over the players, while the commissioner in the NFL does. In either sport, whenever a player is suspended, inevitably the player will at the very least contemplate appealing the decision. However, the sports have very different processes for hearing those appeals. In the NFL, the same person who hands out the suspension would also hear the appeal. For example, Pacman Jones was recently suspended by Roger Goodell for the season. Jones filed an appeal, which will be heard by Goodell! The man who handed out the suspension also had the power to rule on the fairness of that ruling. There is no system of checks and balances, rather the NFL commissioner has absolute power. In MLB, appeals are heard in impartial, binding arbitration. Accordingly, any disciplinary action handed down by Bud Selig is subject to review by a neutral third party. This is the reason why suspensions for players are routinely reduced in MLB, as impartial 3rd party arbitrators rule on the fairness of the disciplinary action. In MLB, the independent grievance process acts as a check on the powers of the owners/commissioner. In the NFL, the appeal process is toothless at best and totally ineffectual and irrelevant at worst. Now, I am not a fan of either PacMan Jones or Michael Vick. The base anti-social behavior they have exhibited is deplorable. PacMan's behavior towards people is despicable. As for Vick, I agree with Mahatama Ghandi when he said, "You can judge a nation according to the way it treats its animals." There is a lot of truth to that statement, as people in positions of power should not use that power to mistreat those over whom they have control. That said, this country is founded on the rule of law. The person charged with the crime is entitled to due process. When the government acts to deprive a person of life, liberty, or property, then it must respect the legal rights of that person. People are innocent until proven guilty. They are entitled to a trial by a jury of their peers, the opportunity to face their accusers, see the evidence presented against him, and put forth his defense. In short, the accused is entitled to a formal legal proceeding before being convicted. Whether you agree with the alleged actions of these football players or not, they are certainly deserving of their day in court before any disciplinary action is taken. However, that is not how it works in the NFL, as the commissioner can act unilaterally to deprive these football players of their ability to make a living. The NFL commissioner has the power to prohibit these players from ever taking the field again. And, he can do so BEFORE they ever have their day in court, much less have been found guilty. The potential for abuse of power is staggering in the NFL and the Vick case is a prime example. Unfortunately, MLB learned the hard way about the potential for abuse of this power, which is why the MLBPA pushed so hard to eliminate this aspect of the commissioner's power. If Vick is truly guilty, then he certainly deserves whatever punishments he has coming to him. But, do we really want a professional sports commissioner sitting in judgment on the actions of player before that player has been afforded his day in court? To me, it is the courts who should determine the guilt or innocence of the players, not the commissioner, who is unqualified for the task. Even the commissioner is not above the law. The commissioner should act on the findings of the court, not in lieu of the court. This is just one example of how Major League Baseball got it right and the NFL got it wrong, but I doubt we'll be reading about that anytime soon, as that just wouldn't be fashionable. Personally, I think we need to maintain a bit of perspective on Pete Mackanin. 3) He's not Jerry Narron. I think those are the three main factors for the Reds success since he took over and I don't think any of those are signs that we should keep him around. 1) The Dead Cat Bounce refers to the idea that a moderate improvement in performance after a sustained period of poor performance does not necessarily indicate improving circumstances. Basically, even a dead cat will bounce if it is dropped from a great enough height. The Reds have been in freefall all year, so a bit of a bounce back doesn't mean that they are on the verge of very good things. That said, I think the Reds recent improvement is likely due to a response to external changes, not due to any real, fundamental improvement in the team itself. I think we are getting a bit carried away that the addition of the Cannon has truly changed things in Cincy. The Reds still are what they are, which isn't necessarily a bad thing (see: #2). There was an interesting article I read that discussed a study performed on the productivity of factor workers. Factory workers worked in a controlled environment under the same conditions for a substantial period of time. One day, the overhead lights were turned up, which made it brighter in the factory (although, the same effect was seen when they made it darker). After that simple change in working conditions the productivity of the employee's improved. Of course, it went back to normal levels after the employees adjusted to the new condition and the effect was not sustainable if changes were made day after day. I think that's part of what is happening with the Reds. Often times, when team's change managers in mid-season, there is an immediate spike in performance. Whether it is due to the desire of the players to impress the new manager, the freedom from no longer working under the old manager, or something else, the effect is not all that rare. That said, it is more than likely a spike in performance, rather than a sustainable, tangible improvement. I think it's likely that the players are responding to a general change in working conditions, not to the individual new manager himself. The Cannon is in his professional honeymoon period and he'll need to sustain it over the long run before we can say anything definitively about his skill-set. Quite frankly, the Reds should never have been THAT bad. There is too much talent for them to be a last place team, especially with a healthy Jr of old, the emergence of Josh Hamilton, a step forward for Phillips, and a bounce back year from Dunn. Personally, I couldn't understand how they could be THAT bad in the first half. Given that they were likely under performing, I think a string of good performances should have been expected. Even if the Reds recent streak is an indicator of future performance and not just a response to changes, I'm still not sure Cannon deserves much credit here, as the Reds really couldn't be that terrible forever. The horrendous bullpen couldn't keep all the positives on this team down forever. Accordingly, everyone is willing to cut him some slack and compare him to his predecessor. Narron's tenure would make just about anyone we brought in look good, so again I'm not sure this is a benefit of The Cannon. In order to be the long term manager of this team, you have to bring more to the table than just being better than Narron. Maybe the Cannon will be a successful manager, but I tend to think he's just caught up in a vortex of positive events that aren't his doing. Personally, I'm still hoping he never gets the chance to shake off that "interim" label. Or, at the very least, has to work very hard to earn it. Personally, I think each component involves a separate and distinct skillset. First, we have Pitch Recognition. 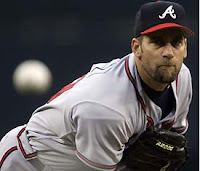 Again, there is a definition in BA which defines Pitch Recognition as "a hitter's ability to identify the type and location of pitchers almost immediately out of the pitcher's hand." So, the hitting process begins when the ball leaves the pitcher's hand. The batter must immediately begin tracking the pitch and make a determination on the type and ultimate location of the pitch. Identification of the type of pitch and whether it will be a hittable pitch are made in this first stage. Second, we have Plate Discipline, which again is defined as: "the ability to not swing at pitches out of the strike zone, or pitches that are less hittable than those that might follow." Once a hitter identifies the type of pitch and the impending location of the pitch, it is up to him to determine whether to swing at this pitch. The whole idea of the disciplined hitter is that he knows his strengths and attempts to force a conclusion to each PA on a pitch that plays to his strengths. I don't care for applying War analogies in sports, as they diminish the severity and sacrifice of the former and inflate the importance of the latter, but I can't think of a better way of explaining this. The War of the Strikezone is the most important component of the game of baseball. It defines the game and ultimately determines the winner. In essence, Batters and Pitchers are at War in each Plate Apppearance. Within that war, each pitch constitutes a battle. The more battles you win, the more control you have over the PA and the more likely you will win the War. Generally speaking, the more often a hitter can work the PA into a hitter's count, the better his chances of success. On the flip side, the more often the pitcher can work the PA into a pitcher's count, then the more likely he will succeed. Win the battles and you'll likely win the war. The disciplined hitter employs a philosophy that involves forcing the pitcher to throw a type of pitch that he can handle to a location within the strikezone that is advantageous to the hitter. He does not give in and let the pitcher define the PA on the pitcher's terms, rather he battles to define the PA on a pitch that maximizes his chances of success. Finally, we have Execution. Once the batter identifies the type of pitch (breaking ball, changeup, etc), the location (outside corner, down and away, etc), and makes the determination that the pitch/location are to his advantage, then he must make the final step and execute. Execution is the actual putting the bat on the ball. After identifying the pitch and making a conscious choice that swinging at the pitches is to his advantage, then the batter must be able to put a good swing on the pitch to take advantage of the good position in which he has placed himself. This step involves the swing. The batter must have a mechanically sound swing and good hand-eye coordination. A hitter can win all the battles, but still end up losing the war by not successfully executing despite the good position in which he has placed himself. That's how I see the hitting process. Three separate stages, each involving a different, unique skill. You don't need to excel at all three to excel. In general, a hitter like Vlad can excel by being able to recognize the type of pitch and being able to hit anything from his nose to his toes. That can make him an elite offensive talent, but it does not make him a disciplined one. Personally, I suspect Adam Dunn excels on Pitch Recognition and Plate Discipline, but falters in the Execution. Dunn is a big man who has a long swing that does not always result in contact, so he can't always take advantage of his ability to put himself in position to succeed. Despite that, I think the truly great hitters excel in all three areas, with Pujols being the best example in the modern game. Ultimately, it is very possible to have substantial success regardless of which approach you utilize, so production still trumps approach at the plate. However, I think it is still instructive to look at the various approaches that are utilized.